Tempered glass shelves have become all the rage these days, especially with modern homes. These shelves go well with modern interior designs and also act as good shelves since they are durable and shock-resistant. Plus, these shelves are very easy to clean. However, they don’t last forever. There will come a time that you should replace and remodel your tempered glass shelves. We say it’s time for remodeling or replacement when your tempered glass shelf already has some cracks and scratches. Most of the times, these little damages could worsen as time passes by. It’s better that you change the panels as soon as you can. If you haven’t noticed any of these little damages before and they have grown bigger, make sure that you change it immediately. Glass shelves with big cracks won’t be able to handle stress and can break anytime soon. You can undoubtedly remodel tempered glass shelves and change their design or even their location. But it is essential that you never cut it, especially if you don’t have the necessary tools and you have never cut glass before. 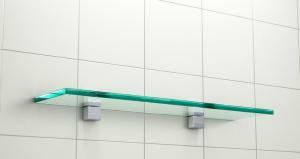 Usually, tempered glass shelves are used in the bathroom. You can transfer it to the living room or wherever you may need a new wall shelf. There’s no definitive time when you should remodel your tempered glass shelves. Some have to replace them after just a few months while some have it for years. It depends on your preference as well as if the panels are still usable.